Even though Julie and Julia is a film about the art of food, Meryl Streep’s performance was more inspiring and fulfilling even than the recipes featured in the film. Streep is without doubt one of the best actors of her generation and her performance here, like the culinary delights featured in the film, was yummy. The two hour long film is based on two books: the first, written by Julie Powell, is based on her blog “The Julie and Julia Project” and the second is “My Life in France” by Julia Child. Director Nora Ephron, best known for the romantic comedies Sleepless in Seattle and You Got Mail, blends in the two books into two parallel story lines with similar happenings and similar revelations as both women find joy in cooking . Twenty-first century New Yorker Powell (Adams) is stuck with a cubical day job and a half finished novel. Finding comfort in food, she decides to cook her way through Julia Child’s (Streep) iconic book “Mastering the Art of French Cooking,” which introduced the joys and delights of French cuisine to America. The film also follows Julia Child’s life in post World War II Paris with her husband (Tucci), where she finds her true self in French cooking. The film goes back and forth, following the two women’s lives with Julie determined to finish her project and Julia equally as driven to publish her book after finishing her French cooking classes. With her performance, Streep lands yet another Academy Award nomination for her heartfelt and funny portrayal of the energetic Julia Child, while Amy Adams is a little unconvincing, dragging her character into a cartoonish zone. Some of the scenes with her husband lack chemistry and energy to such a degree that they’re hard to watch. The screenplay is full of unbelievable circumstances, relevant only to link the two women together, and it comes off weak and unsatisfying at times. 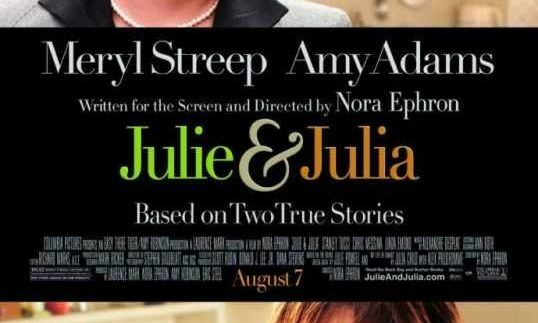 Due to the flavoursome performances of Meryl Streep, however, the missing ingredient in Julie and Julia might go unnoticed. You’ll leave the film wanting to head straight to the kitchen and cook up something, so make sure the fridge is stocked!